A popular texture in condominiums, office spaces and homes with large ceiling expanses. Generally this texture is ‘as is’ and does not require painting. However, many contractors prefer priming and painting over it for universal color coverage. It is more difficult to keep clean due to the many crags and crevices inherent in this texture. This texture is primarily done on ceilings. 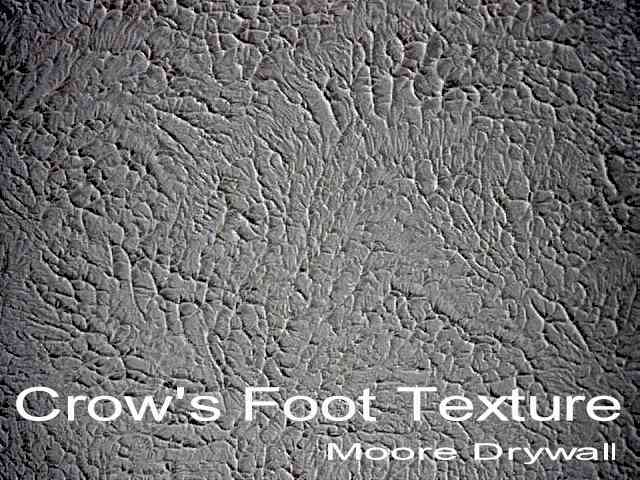 Drywall compound is applied to ceiling using an air compressor, rolled flat to insure uniform coverage then crow’s foot brushes are ‘stomped’ into the ceiling creating the impression of bird’s footprints. Conceals ceiling imperfections better than lighter textures.